Mumbai, December 12: Soaring high on the defence front, the India Navy joined the elite club of nations as it commissioned its first deep submergence rescue vehicle (DSRV). Indian Navy chief Admiral Sunil Lanba commissioned the vessel at the naval dockyard in Mumbai on Wednesday. The DSRV is commissioned along with associated equipment- built by the UK’s James Fisher & Sons. The DSRV is capable of diving over 666 meters, the Remote Operations Vehicle (ROV) dives to 750 meters and the side scan sonar dives to 650 meters. To ensure early mobilization, the system has been procured in a flyaway configuration which permits rapid transportation of the rescue system from the base to the exact location of the distressed submarine by transportation using air, land and sea vessels. 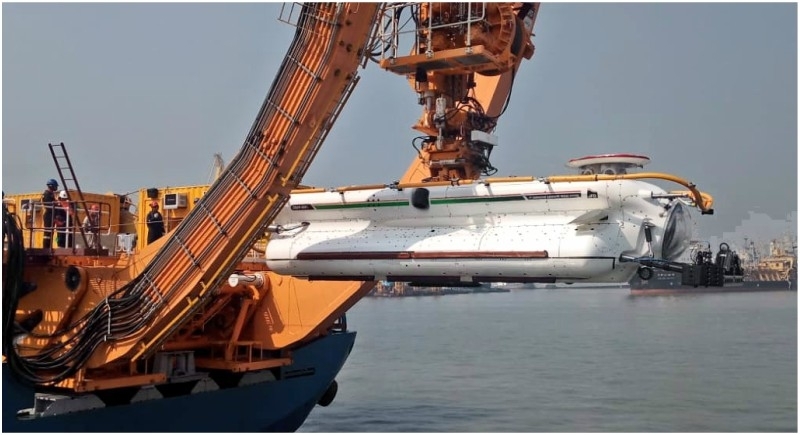 Indian Navy chief Admiral Sunil Lanba commissioned the vessel after the western naval command successfully concluded the maiden trials of the DSRV, which has ushered in a niche capability of submarine rescue into the Navy. The second DSRV will be inducted at Visakhapatnam, the Navy's other submarine base on the eastern seaboard, in 2019. The Indian Navy which currently has 15 submarines, most of which are over two decades old, has been coping with basic submarine rescue capabilities comprising rescue "bells", which are containers that can be lowered to the submarine in distress up to a maximum of 150 metres and which the Navy can only operate from its diving support ship, the INS Nireekshak.